Today saw the YTRRC Ash races at Ash Primary School, it was a great day and got a bit hot as well. For the Club, we had Paul Card first over the line and Nikki was our first lady. we also won both the Men's and Ladies team events, Anita and Lesley both won a Vet prize so well done all, some great running. Thanks to all that help to make this a great Club event, the results we be published as soon as I get them. I took some 800 photographs but sadly they are all too big so it will take some time to reduce them small enough to upload but I am on it. Saturday saw the inaugural Crafty Fox Marathon, I would like to say it was 26.2 miles long and rather flat but I would be lying. It is a White Star Running event held in sunny Dorset, a place called Lower Ansty. This was also Richard Dodge's 100th Marathon but more on that later. There was a good turn out by YTRRC and the start photograph was taken. The route took in some lovely views but to get to them meant hills, there was very little flat in the 2 lap course it was up or down. On the first lap as we got to the halfway point naturally the watch said 13.7 meaning the course would be at least 27 miles, well it is WSR and Dorset miles are longer. Kev Brittle was the first Club runner over the line with Lynne and Anita sharing first lady. I have to say one of the hardest I have done but the second lap seemed easier but then I knew what was coming. Well done all that did this so soon after City to Sea as well. As I said it was Richard's 100th well 103 but planning always takes in a few extra just in case. Well done Richard and now there are 2 of us with the third on their way. 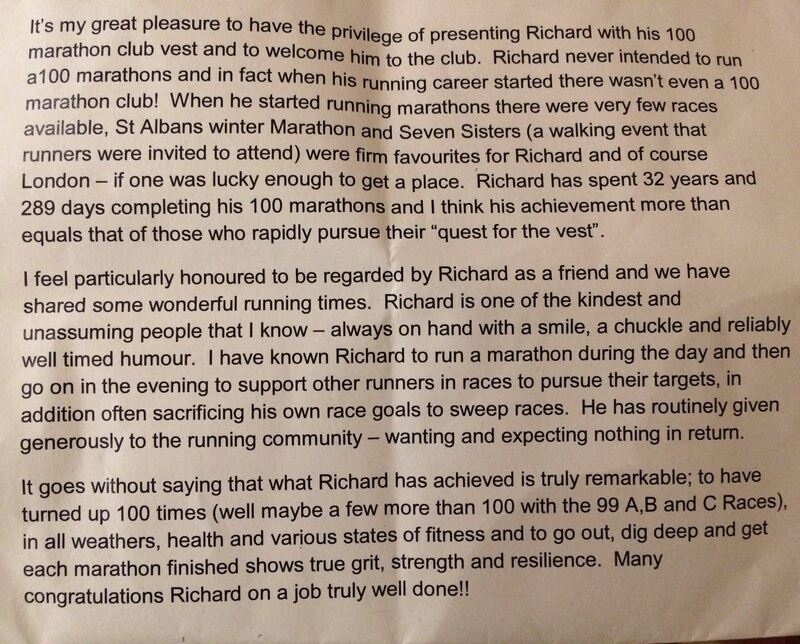 Tara, a 100 Marathon Club member did the presentation in the beer tent and gave Richard his 100 Club Vest. It's the last one this week so let's go out with a great one. From Bryn: The Club will be sending an email asking for people to join a small organising committee for next year's Yeovil Marathon and Heron Half. The email will detail the specific roles required with the first meeting taking place a week before next month's Club Committee meeting, date TBC. All members are asked to seriously consider taking on this opportunity because no one comes forward there will be no Yeovil Marathon or Heron Half next year and in the future. From Bryn: The Club will be sending an email asking for people to join a small organising committee for next year's Yeovil Marathon and Heron Half. The email will detail the specific roles required with the first meeting taking place a week before next month's Club Committee meeting, date TBC. All members are asked to seriously consider taking on this opportunity because no one comes forward there will be no Yeovil Marathon or Heron Half next year and in the future. See below provisional list of races for next years Club Championship Competition. The dates are mostly to be confirmed as they haven't been published by the organising clubs as yet. The Full Monty on 2nd December fills up quickly (often by the end of September) so you will need to be quick to enter this one to get you started on your challenge. I am envisaging the Rules to be the same as this year but if there are any minor changes these will be published in due course. These are subject to change depending on any unforeseen circumstances. From Alison: Lymington Park run. Lovely setting around the skate park and gardens. Sorry about the selfie as we still need more practice. 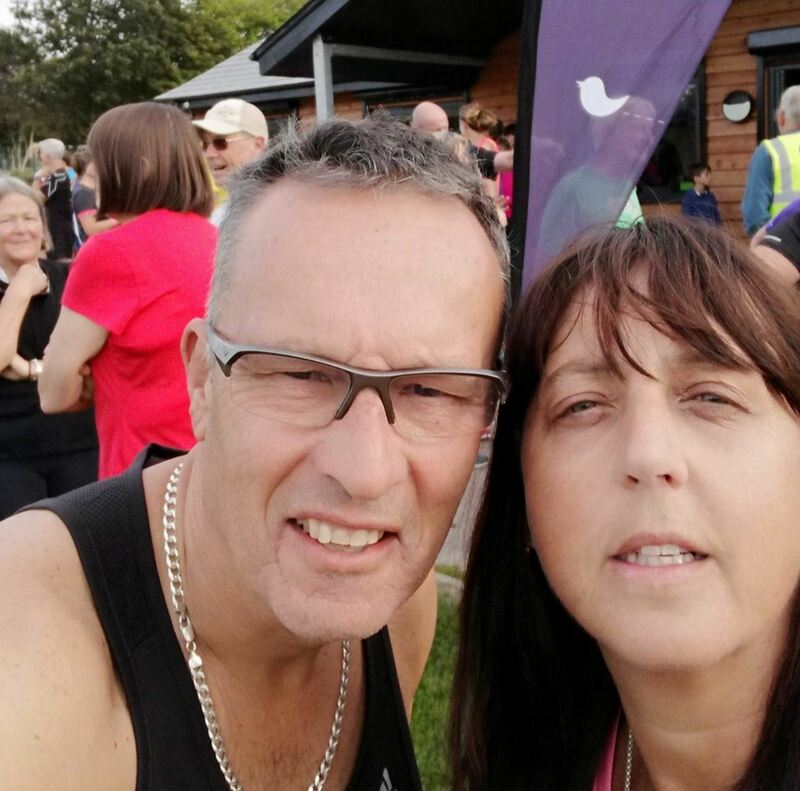 From Katie: Henstridge Airfield first parkrun. Lovely well supported route. Recommend this oneHenstridge Airfield first parkrun. We have had a few now that have paid and also voted so thanks, can I ask you all to try and Vote and just leave any you are not sure about blank. The Awards night can be booked here. Can you all please Vote. The pub run was organised by Phil. I had the pleasure of leading and armed with an OS Explorer map of the area, I chose to repeat the route used last time. We set off running across fields heading towards the church at North Perrott. We picked up the track and entered the village via the stony streamside path. Turning right and left we ran up the track to Pipplepen farm. We took the track on the left and ran across fields to Misterton. There were no cows this time. A series of paths, streets, and paths incorporating tennis court, football field, and allotments, took us to the main road. We ran up the road to the corner and turned left to go up a lane and then off-road. Following the Liberty Trail, an effort was made not to go wrong as we did last time. We overshot and reached a large barn. To correct we had to go back and cross a field of maize with no path, aiming for some woods a 100 yards or more away. Without damaging the crop, we reached the woods and followed the edge until we came to a road. With darkness falling quickly we climbed going up a narrow overgrown path and reached another road at the top. The last mile or so in semi-darkness was along an undulating road, and eventually downwards back into Mosterton and the pub. Thanks Phil and all. It was a great run.